Organic strawberries were on sale this week. Although these are not local strawberries, it’s still good to take advantage of the bounty – particularly in preparation for when there will be none (I’m thinking of the cold wintery months that will inevitably be upon us). 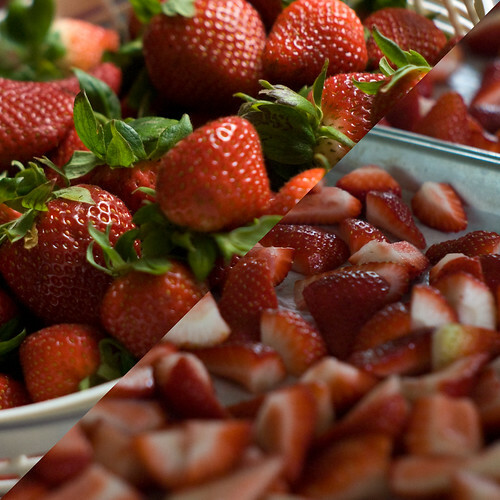 These early, store-bought strawberries are washed, cut up and frozen on cookie sheets for later storage in freezer bags. Doing the bulk of the saving now, will let us enjoy (a.k.a gorge on) the fresh local strawberries when they start showing up (including the ones from our yard), without having to save them for later. Also new this weekend, is my adoption of a new bible. I’ve been hearing a lot about this book, so I’ve decided to acquire a copy for myself to follow. I familiarized myself with the master recipe today, and looks like the hype is warranted (and, I bet it’s good for the soul, too). This, of course, is the book Artisan Bread in Five Minutes a Day. For this initial trial run, I cut the salt back quite a bit (almost half of what was called for), but that’s the only change. I now have a bowl of dough in the fridge ready to be drawn from and baked during the coming week (which fits perfectly with my tendency during the summer to wake up early). I’m sure Virginia won’t mind the smell of baking bread in the wee hours of the morning. And, some of you may have seen this photo when I uploaded it to Flickr the other day. 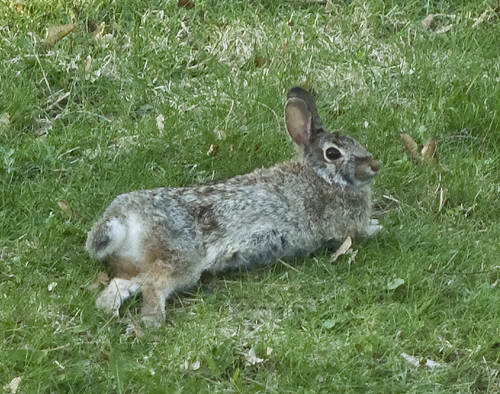 Our yard, full of all things green, is also home to a couple of bunnies. Their own bounty has made them probably a little too comfortable with their surroundings. It cracks me up whenever I see them hanging out after they’ve grazed, lying on their fattened bellies. 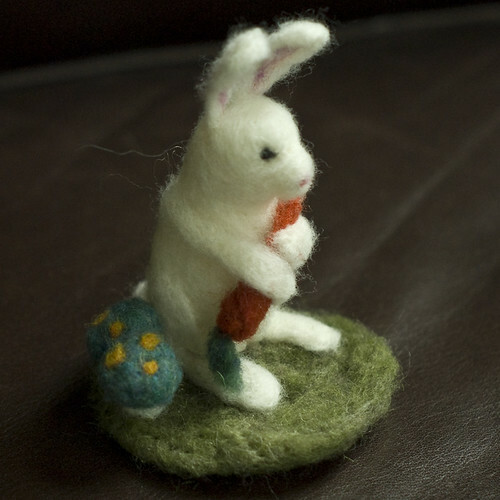 We’re starting to call our house “Bunny Acres.” They’ve also inspired a few felted creations, including this little felted friend with a carrot. You will LOVE using Artisan Bread – it’s a FANTASTIC book. They have a followup that uses more whole grains and healthier options, too. I have it, but haven’t used any recipes from it just yet. 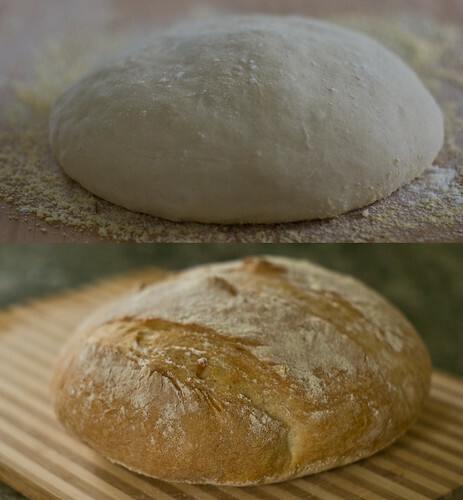 The winter before last I baked Artisan Bread constantly and my family loved it…but this last winter was very busy with purchasing a house and pregnancy, so I didn’t make a single batch of dough…sad. The rest of the year it is just too hot in So Cal to be turning the oven up that high. Now that I have a new backyard gardening is my obsession. Roses grow beautifully here. Continue to enjoy the simple pleasures, Dan! I love the beauty in your blog.